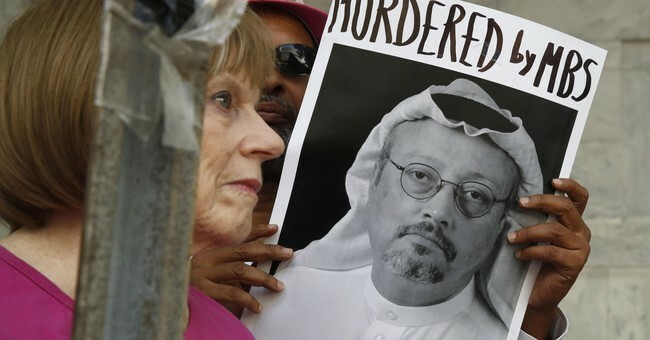 President Trump announced Monday morning he has spoken directly to Saudi Arabian King Salman bin Abdulaziz Al Saud about the disappearance of Saudi journalist Jamal Kashoggi in Turkey. Khashoggi entered the Saudi Embassy in Ankara last week and according to all current evidence, didn't walk out. It is suspected he was murdered by 15 Saudi hitmen, who then dismembered his body. Khashoggi's has three children who are U.S. citizens and he works as a columnist for the Washington Post. During an interview with 60 Minutes Sunday night, President Trump said there would be "severe consequences" if Saudi ordered Khashoggi's killing. During a meeting in the Oval Office Saturday with released hostage Pastor Andrew Brunson, who was held in Turkey for two years by President Recep Erdogan's regime, President Trump said his administration was still gathering all of the facts on the matter and invited Khashoggi's fiance to a meeting at the White House. "Now, as of this moment, nobody knows what happened. As of this moment we're looking into it very seriously. Turkey is looking into it at a very high level, at the highest level and so is Saudi Arabia," Trump said. "We've invited his fiancee. We've invited her. So, she actually wrote a letter to myself and the first lady, and a beautiful letter, and we have invited her, and I believe they're working it out where she'll be coming. I mean, I'd love to have her great news where it wouldn't even be necessary, but at this point, it's looking like — it's looking like he perhaps won't be or isn't around and that's very sad," he continued. "I think we would have known by now. That was our first hope. Our first hope was that he was not killed, but maybe that's not looking — is not looking too good right? From what we're hearing." Secretary of State Mike Pompeo has been ordered to meet with King Salman in Saudi Arabia to get the bottom of what happened. He's leaving within the hour. Pres Trump says @SecPompeo literally leaving within the hour for Saudi Arabia for talks on what happened to @washingtonpost columnist Jamal Khashoogi. Pres says Pompeo will also go to Turkey to learn first hand of their intelligence on the fate of Khashoggi.